Do you ever get tired of the same old workout routine? If you're like me then you're bound to get bored going through the same old motions in your attempt to stay in shape and get fit. Perhaps it's time to switch it up a bit and add some more fun to your workout. There just so happens to be a great new exercise program that can do just that. It's called Zumba®! Zumba® is a combination of fitness, fun, and dancing all thrown into one. It actually originated in Colombia in the mid-90's by a guy named Alberto "Beto" Perez. Beto (as he is referred to) actually developed Zumba® by accident. He was an aerobics instructor and forgot his traditional aerobics music one day. So he did what many of us would do... improvised! Beto had some of his favorite music that he loved to listen to with him. This consisted of some fun and energetic salsa and merengue music. Instead of teaching the same old routine that day for his aerobics class he jazzed it up a little and had a special and invigorating dance aerobics session all to the beat of his favorite latin music. His students loved it! By the end of the class everyone was smiling from ear to ear and full of energy. And ever since Zumba® has become one of the most popular and well liked music inspired dance-fitness programs in the world. 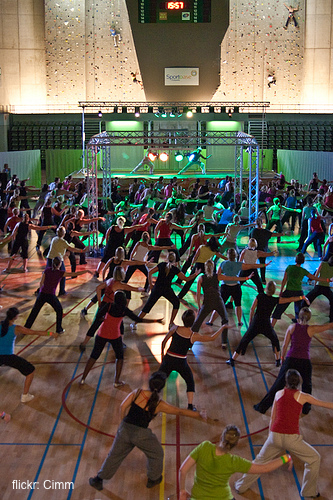 Beto brought Zumba® to the United States in 2001 and it's now in over 90,000 locations across more than 110 countries. into the original Zumba routine. in this great workout session. specifically with the music and dance moves that kids love. exercises all in a 30 minute routine. If this workout program interests you then you can find more info below at the Zumba® website. Make sure you get the go ahead from your doctor before you start any new workout routine just to be on the safe side. Enjoy! And may your dance moves be the best thing that's happened to you in a long time!